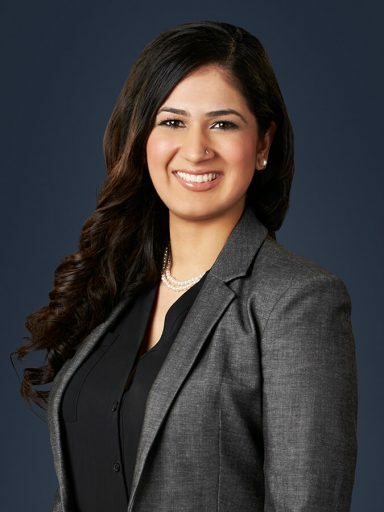 Supriya Sharma is an Associate Lawyer at Mazin & Associates, PC, Personal Injury Lawyers in Toronto and Ontario. Supriya is experienced in the fields of serious personal injury matters, including Accident Benefits and Tort Litigation. She has a passion for helping those injured in serious car accidents as well as other serious injuries. Supriya returned as an associate lawyer to Mazin & Associates, PC, Personal Injury Lawyers after completing her articling at the personal injury firm. Supriya excels in public speaking and hopes to make a difference in the lives of personal injury victims with the power of persuasive arguments. She is devoted to using her legal skills and diverse background in achieving excellent results for your claims. Before joining Mazin & Associates PC, Personal Injury Lawyers she acquired several years of personal injury experience. Supriya also assists Gary with complex brain injury and spinal cord injury cases, as well as birth injury cases such as those involving cerebral palsy. Supriya focuses on achieving the best possible result for all clients. Supriya holds a law degree from the University of Wolverhampton Law School in England and graduated with academic distinction with top-tier class ranking.